Traveling through Thailand in 2008, we fell in love with the cuisine -- fresh vibrant vegetables prepared with an exotic array of spices. So exotic, in fact, that you couldn't find them all here. Determined, I asked a few random Thai women at the Carmel Market where they found fresh galangal, a key ingredient in curry pastes and soups, and they told me you simply couldn't find it here. So you can imagine how thrilled I was when I passed by Carmela's stand at the Carmel Market last week and there, next to the ginger, was a pile of strange, burly roots -- not just galangal, but turmeric to boot. Update: Unfortunately, I've stopped seeing fresh galangal and turmeric at the market stands. The shops listed below still offer a good selection of produce and ingredients from the Far East, though. 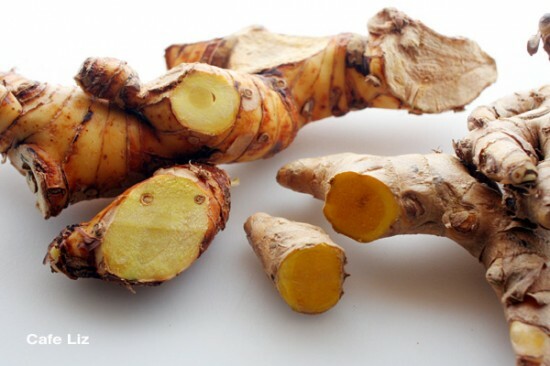 Both galangal and turmeric are rhizomes in the ginger family. Galangal in particular plays a major role in Thai cooking, and there's no substitute. While dried galangal is available here, it just isn't as versatile (not to mention fresh), and wouldn't make a very good chili paste, for instance. As for turmeric, there's a major difference between the fresh root and the dried, powdered stuff that frequently appears in Middle Eastern cooking. (For that matter -- why is it that cuisines in so many regions use an awful lot of powdered turmeric, poor man's saffron, but have never seen the real, live root?) While the powdered stuff tastes at best chalky if you ask me, the root has a zing to it -- a hint of menthol, a spiciness in a ginger kind of way (but no ginger taste, if that makes sense). Apparently the essential oils break down as the root dries, which is why the dry spice bears no resemblance to the real thing. In the photo: Galangal on the left, and turmeric on the right. 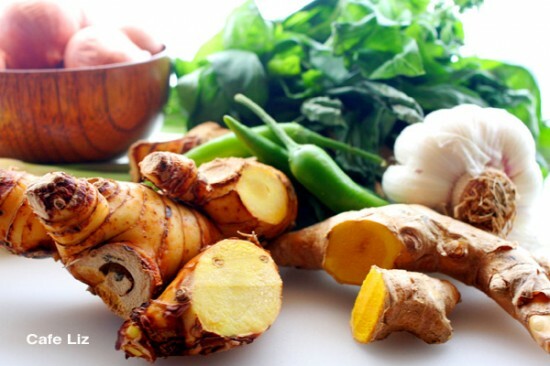 In any case, the flavors of galangal and turmeric cannot really be described to someone who hasn't tried them. As Eitan put it, when I gave him a bit of each root to try, they were like nothing he'd ever tasted before. It's somewhat surprising that it took this long, since there already are several vegetable stands at the Carmel Market that cater to people with tastes from the Far East. You can find green papayas, morning glory greens, bird's eye chillies, foot-long green beans and various and sundry varieties of eggplants. Beyond the vegetables I recognized from Thailand, these stands offer plantains, yucca, long Indian okra and all sorts of gourds and things I haven't been able to identify. However, none of this can be taken for granted -- it may be a globalized world, but many food items have entered the Israeli market only recently, meaning over the past decade or so, and while I can't say I long for all the bizarre, processed things that fill the shelves in the United States, many of which we don't have here, more exotic species of fruits and vegetables are still trickling their way into this agricultural powerhouse of a country. Meanwhile, now that I've stocked up on galangal and turmeric -- because who knows if they'll be here in the future -- I'm keeping them stored outside the fridge, in the hopes that some will sprout, giving me a handsome plant. Plus, the leaves can be used in cooking, too. Update: Six months later, I indeed have a handsome turmeric plant. I cut off sections of the rhizome that had buds, and lay them on soil. They all sprouted. The plant likes heat and moisture, and a relatively large pot for the roots to spread. So, where can you find it all? The galangal and turmeric are now being sold by Carmela, the greengrocer at the Carmelit end of the main Carmel Market strip (near the intersection of Carmel and Kalisher). Galangal was 50 shekels a kilo, while turmeric was being sold pre-packaged, about two roots per package, for 15 shekels. For other kinds of vegetables from the Far East, you can count on Asian Vegetables, at Yom Tov 10, a side alley in the Carmel Market. I found out that the stand has an official name because Dudu, the proprietor, gave me his card. His phone number is 052-3583016, by the way. He frequently carries a few kinds of exotic eggplants as well as various gourds, and other things I can't always name. 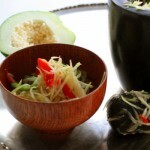 The small, round green eggplants, which appear in Thai soups, won't be in season for another month, he says. 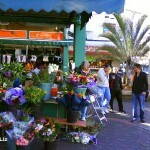 There's also the greengrocer on Carmel Street, more or less across from the intersection of Haim Habshush. He generally has several kinds of green beans out front, but also stocks a variety of vegetables catering to Thai customers. I've seen chilis, eggplants, Thai spinach, morning glory and papaya, among others. 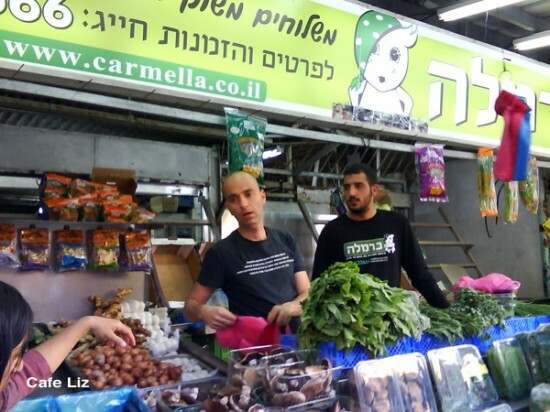 As for oyster mushrooms, many of the mushroom sellers carry them, including Carmela and the guys on Carmel Street across from the intersection of Shapir. East West (Carmel 17, in the middle of the market) has many ingredients that are not fresh, such as dried galangal, dried kaffir lime leaves and about six kinds of coconut milk. You can get non-kosher oyster sauce and fish sauce there, as well as kosher/vegetarian alternatives -- mushroom sauce in place of oyster sauce, and sauce or salt instead of fish sauce (soy sauce makes light curries brown). I also have a bottle of anchovy-based fish sauce, which is kosher, but obviously not vegetarian. Last but not least, there's the Thai shop on Gedera Street (parallel to Carmel Street, to the north), near the corner of Rabbi Akiva. This store mostly caters to actual Thai people, as opposed to East West, which counts Israelis planning sushi parties among its clientele. It has less of a selection, but what it does have is cheaper. UPDATE, APR 23: East West now is also selling fresh galangal and turmeric, as is the stand with the mushrooms/papayas a little farther down the street (to the west/toward the Carmelit). You can find all these stores on my Google map of Thai food at the Carmel market. 19 Responses to "Cooking Thai in Israel: Galangal and turmeric enter the market"
Great for pointing this out, I too love Thai food but seldom make it because at the end with all the substitutions it does not taste the same as I remember in Thailand. Fresh galangal? Seriously? This is very exciting news! I wonder if anywhere closer to me stocks it, I’ll have to investigate. If not, I suspect a trip to the shuk is in order. I use the dried stuff all the time but it just isn’t the same. This is the problem with Asian food, you often need to alter the recipe you might have found as you can’t get all the ingredients. Talking about Thai food, do you have a recipe for Pad Thai? I had no idea you could get “morning glory” in Israel. I couldn’t stop eating the stuff when I was in Vietnam. I grow thai basil and lemongrass in my garden but have relied on dried galangal. I’m going to make a special trip and hopefully I’ll be able to get the galangal to sprout as well. That would be an epic win. And awesome map. Thanks! Like you put it, I’m also looking forward to more asian plants being imported to Israel, or better yet – grown here. I think we could certainly do with some jackfruit and some durian! Thank you for this interesting report about turmeric and galangal. I liked that you emphasize the difference in taste between the dried, powdered and the fresh roots. 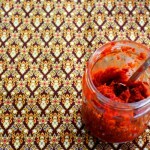 Did you ever try to cultivate your own ginger at home? Hi A-Man, I haven’t even grown ginger at home, but last week I did set aside a fresh root to sprout. I think my turmeric is on the way to sprouting first, though! Take care. Did you say plantains!!! Real honest to goodness plantains (green bananas)? I have to get over to Shuk HaCarmel. I haven’t been there in a long, long time. I love cooking with galangal, but I have only cooked with dried. Hey Harry, before you head out, note my update — fresh galangal and turmeric are now being sold at East West, as well as another place or two, which is nice, because Carmella’s supply was dwindling as of last weekend. Seems they’re catching on. My galangal root seems to be a little too dry to sprout, but I think I’m well on the way to having a turmeric plant! Hi Ilana-Davita, on the bright side, these alterations are what enable us to make a foreign cuisine in our own kitchens … I do indeed have a recipe for pad thai, and as I noted in that recipe (coincidence? ), there are several alterations that just make it easier in a Western kitchen. Or you could go authentic with fish sauce, palm sugar, etc. Hey Baroness, I haven’t looked for plantains in a while, but they definitely are sold there! Thank you Liz. I have the fish sauce but not the palm sugar. Wow, this is great news. For years I looked high and low for galangal, and asked every bewildered Thai worker I ran into if they’d seen it. Can you tell me where Carmella’s is, so I don’t embarass myself asking the other vendors? I assume East West is the Chinese grocer next to the parking lot? I don’t suppose they’re importing fresh kaffir lime leaves, as well? By the way, palm sugar is available at the Castel Teva health food chain (at least at the one in Herzliya Pituach). Unfortunately, I haven’t seen fresh kaffir lime leaves, but you can get dried ones.